Leah Remini is shooting a TV series about Scientology. The following excerpt is very deliberately a teaser so you will be enticed to read the entire original story. But what’s especially exciting for Scientology watchers is that the same network is also developing another series, also about the way Scientology rips apart families, and this one is being produced by former Scientology celebrity Leah Remini. We broke the news in 2013 that Leah ditched Scientology, which she had grown up in. The King of Queens actress came out with a bestselling memoir last November, Troublemaker, with juicy anecdotes about what it was like to be a celebrity in a celebrity-obsessed church. Three years after leaving Scientology—and just eight months after releasing a memoir about her departure—Leah Remini is “shooting” a television series about the church and how it destroys families. Look out David Miscavige, Leah Remini may be getting ready to spill all-new Scientology secrets! According to Scientology reporter Tony Ortega, the actress, who left the church in 2013, is currently producing a television series on the organization’s “disconnection” process, a policy that forces families to stop all contact from relatives who choose to leave the church. Leah Remini Is Producing A TV Show About Scientology. Actress Leah Remini left Scientology three years ago and has since dished out some of their dirty secrets on TV and in a tell-all memoir. She's now channeling some of these personal traumas into a more creative outlet. Journalist Tony Ortega, who has reported on Scientology for over two decades, has the scoop on his blog The Underground Bunker, saying Remini is working on a show "about the way Scientology rips apart families." Actress Leah Remini has been vocal about how messed up she feels Scientology is since she left the religion in 2013. In a 20/20 interview last year, Remini spoke about the punishing conditions she endured in the church’s Sea Org, and that time Katie Holmes wrote her up to Scientology brass over an incident that happened at her wedding to Tom Cruise. Now Remini is producing a TV show about Scientology around the theme of how it “rips apart families.” Sounds like this will be a bit heavier than The King of Queens. According to The Underground Bunker, journalist Tony Ortega’s website that’s dedicated to exposing Scientology, Remini’s series is already shooting, and will appear on the same network as another show about Scientology’s disconnection policy. I luv that woman, troublemaker. Davey and your Yingling sidekick and other lawyer cohorts are toast. There is no escape, we are relentless, defiant, resolute. Leah Remini Is Apparently Filming Footage for a Show About How Scientology Tears Families Apart. Looks like Leah Remini has begun collecting footage for a new television series on the Church of Scientology. Yup. AND she really did grow up in New York. Leah Remini To Piss Off Tom Cruise For An Eternity With Reported Scientology Series. Leah Remini isn’t done telling all. The self-proclaimed troublemaker is reportedly helming a new TV series about “the way Scientology rips apart families” — a subject with which she is all too familiar. Journalist Tony Ortega, who lent his expertise to the 2015 Scientology exposé “Going Clear,” wrote in a blog post Monday morning that production for the series is already underway. “We’ve confirmed that Leah’s series is currently shooting footage and appears to be on a fast track,” Ortega stated. 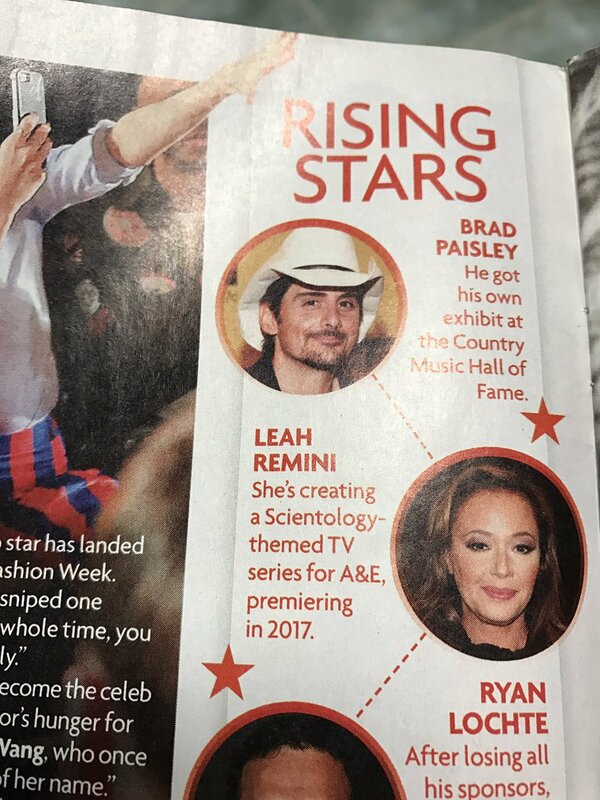 Leah Remini Is Still Not Done Ripping Scientology A New One. Apparently, Leah Remini still has plenty to say about her experience with Scientology. So much, in fact, that she is reportedly producing a show on the subject. Tony Ortega, a journalist who has long covered the controversial faith and appears in the 2015 HBO documentary Going Clear, announced via his blog today that The King of Queens star is currently working on a series "about the way Scientology rips apart families." Wadamess A cluster of evil women! Oh Daveyboy, what have you done ???? I really appreciate how brave Leah Remini was to leave Scientology and speak out about the cult. She turned the conversation around on Scientology, and that was truly brave. However I tried to watch her VH1 reality show focusing on her family life, which she executive produced, and it was… not good. Maybe I have little patience for reality shows, which is true, but that’s why I’m not 100% sold on this new documentary Leah Remini is making, which will focus on the ways Scientology breaks up families when one member wants out of the cult. The practice is called called disconnection, Scientology denies they do it just like they deny all the other human rights abuses they commit, but there’s plenty of evidence for it and Leah is currently making a documentary about it. There’s also another documentary about the same Scientology disconnection process in the works, and it will feature different families. Scientology expert, journalist Tony Ortega, has the news. I will watch the first episode of Leah’s new show and give it a chance. She deserves so much credit for putting everything on the line to speak out against Scientology, and she must have some incredible and heartbreaking stories of ex-members to share. Leah is somewhat insulated by her celebrity and her wealth, and I’m sure it’s so much worse for people who work countless hours for little to no pay who try to leave the cult with no money and no connections. Maybe, by sharing their stories, Leah can help. The pressure needs to continue on Scientology so that this criminal organization can ultimately be disbanded. New York Daily News. Nothing really new, but does recap some history. Lainey has a very nice article about this that provides some historical perspective. Read it all. Back in 2013, Leah Remini was fresh out of Scientology, getting ready for a stint on Dancing with the Stars. At the time, I said it was a smart move – and aggressive. Leah Remini may have been privately scared of the implications of leaving the Church, but publicly she was tough. And it paid off. Three years on, she’s had a bestselling book, a reality show and she consistently works. She’s still very present. Leah’s career is likely exactly where it would be had she stayed a Scientologist. Her life didn’t fall apart. In fact, she seems to be thriving and incredibly happy in her home and professional life. Leah wants us to see MORE. She’s working with A&E on a new show and according to THR, details are scarce. I like this strategy too – a big reveal. Don’t let them see what is coming. It’s something she learned from them. And what is coming? The show will reportedly focus on families; ones I’m guessing are trying to reconnect with family members still in the Church. So Leah is actually living up to one of the Church tenets to help her community, reach out to people, save families. Save people.